Left and Write: Monday Smorgasbord! It's been one of "those" days....for about a week now. O.k, well it's really not as dire as all that, but it has been one of those kind of days where I couldn't really come up with a decent topic to blog about. I had a couple of things in mind, last night, but when I got behind the keyboard, they just wouldn't flow like I wanted them to. Then, for some reason, I started thinking about food (shocking, I know! )....then my mind went back to a place we used to go when I was a kid, called Duff's Smorgasbord. It was a buffet style, all you can eat, joint where I certainly used to take advantage of the term "all you can eat". As a kid, I used to be able to put it away and I'm sure a night out to Duff's probably put the grocery budget in a better place. Anyway, I've always been a big fan of 'choices', so I figured it might be nice to translate that into some blogging as well as give me something (anything!) to talk about. So, today, I give you all a smorgasbord of topics. Don't worry, none are too filling and they'll be even lighter on the calories. Yep...I kid you not. It's a real sign and the story behind it can be found HERE. There was another odd story about a man jailed for throwing eggs at courthouse workers. As odd as these stories were, they were both written in a pretty whimsical style. It was like the reporter's editors said 'just have fun with it'....which they, obviously, did. Since Google Reader is going the way of the dodo July 13th, it looks like Feedly (free for now) is testing the waters to see if we're willing to pay for their service. In all honestly, I'm not that thrilled with its free offering and, sincerely, doubt I'd pay for it should they go that route. If they do decide to go to a pay model, I may have to give Bloglovin' a harder look. Just in case you missed it during Once Upon A Time, ABC ran a short promo for their new S.H.I.E.L.D series. I have to admit, it looks pretty cool and should give Joss Whedon's band of Browncoats something to cheer about....even though, supposedly, he's only working on the first episode. My only reservation being that some of Whedon's Dollhouse alumnus will be heading this one up....and I wasn't a fan of Dollhouse....at all. Still, I'm willing to let bygones be bygones and give it a shot. And, finally, since it's Music Monday I'll leave you with one of my favorites from that awesome era in music known as the 1980s. You can really tell this was made in music video's infancy....lol. There you have it...my smorgasbord offering for today. Of course I guess this probably isn't the best time to mention that Duff's was closed due to Health Department infractions, right? Hope your Monday was a good one! *gasps* How have I not heard about Agents of SHIELD? I want to be really excited about it. I just don't know, though. Hilarious stories! Dollhouse was a brilliant show in concept and would have been in execution except that Fox told Whedon that he was only going to get one season, so he did that future jump thing, then they told him he'd get two seasons, so he had to fix that, which kind of messed up the arc of the show. I'm totally siked for SHIELD!! I know it's gonna rock!! And I'd totally buy a used cow... But only slightly used. I. Not an idiot or anything. I like variety too. I don't eat a lot of buffets but I love them because I can eat a little of a lot of things. Oh dear I'm using feedly and didn't know they were planning to ask for payment in the future! Bloglovin it is, then. I signed up for Feedly, but wasn't really fond of it, so I'm sort of in limbo. Guess I need to figure it out sooner rather than later. Sigh. Used cows, eh? Think they have any used goats? I'm very excited about the SHIELD Show and hope it will live up to expectations! Hi Mark - well that spread looks distinctly more tasteful and desirable than my cup of coffee! Used cows .. not sure where I'd put them ...but Feedin Feedly -oh dear .. I've thought of that route .. now I'll look at BlogLovin ... I need to do a check - thanks for that update .. Loved the Uesd Cows story but not so sure about the Bloglovin fee.....havn't heard of that one before. Thanks for that bit of information. 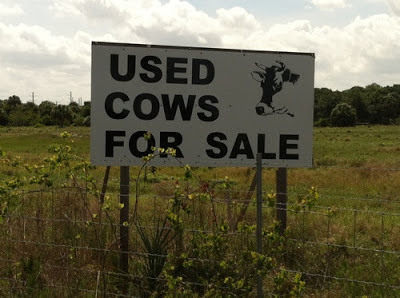 Used cows? Well...I got nothing. Will check out Agents of Shield though, definitely interested in that. Honeymoon Suite! Now there's a blast from the past. I'm using both Feedly and Bloglovin' at the moment. I like things about both and figure I'm safer getting used to both, especially if one either tanks or goes to a paid service. Saw the Agents of SHIELD ad online yesterday - it does look badass. I love me a buffet!!!! I have no problem knockin' people over to get to the good stuff. And hey, think of the awesome deals on milk and beef you can get from those used cows. Great post, Mark. 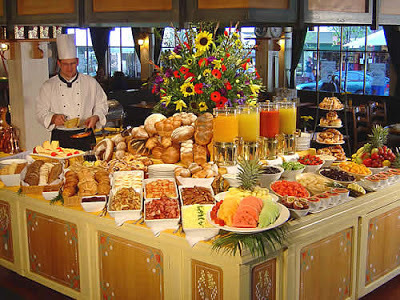 I love a buffet lunch. Used cows for sale had me in splits. *giggles* Used cows... *snerk* I'm from Idaho originally, the only place you can end up on the highway behind a cow, on a road so bendy you can't get around the thing... Cows are slow, by the way. I hadn't heard about S.H.I.E.L.D. either, and I LOVE Whedon! Excited to check it out! not excited about the reader disbandment. feedly is ok, but i aint paying! i will use my blog roll. but will that be functional? will my followings still exist? i need specific instructions! i hate that google is leaving for cigarettes and never coming back!! its not us, its them!! We used to go to this smorgasbord place called the Sweden House. So yummy. Now I'm hungry for lunch, and it's only 9:25. Maybe I can round up a slice of toast. @Andrew: I've heard that as well as the second season being much better than the first. I'm glad, at least, Whedon has seemed to have learned his lesson and not work with Fox, lol. @Dee: Well, it looks like they're just in the 'maybe' phase and haven't started charging...yet. But, if they do, I'll be looking elsewhere for my reader needs. @Hilary: LOL...I know what you mean...my mouth waters every time I look at it :) I might be giving Bloglovin' another look, as well. Have a great one, yourself! @Sheena: I just have to wonder what people driving by and seeing that sign must have thought! I switched to Bloglovin as my reader and it works great. Automatically transfers all the blogs from Google Reader and allows you to add others, like from WordPress. Best part about following your blog is that you make my boys think I'm smart. I say, "So ABC is doing the S.H.I.E.L.D series?" and they think I am awesome! That was a great smorgasboard, Mark! I loved the cow sign. I haven't found many TV shows I've liked in the last few years. Dollhouse is awful. I'm tired of Vamp Diaries and Walking Dead. True Blood was ruined for me once they all started taking their clothes off. It's hard to watch American Horror Story when I dislike all the characters. Great post, Mark. You always have great posts! There's so much I need to catch up on! I've been all "Smorgasbordy" for a month, but am excited to be back to blogging. Now I need to read about the used cows. Even if they shut down Duff's, at least you are still alive, right? @Lexa: I'm the same about t.v. anymore. All those channels and nothing to watch. Give me the days when we only had four channels (if you were lucky) again! I'm hoping SHIELD does well, too. @Susan: LOL...that's a great story and I'll bet some thought it was really true :) It was a franchise place, I think, so there could have been one out by you. Guess the feedly thing shows to go you that there ain't no such thing as a free lunch. We're not paying for blogging, but then again maybe we are. Ever noticed how much more junk mail/solicitations you're getting since starting the blog? Speaking of smorgasbords, my husband tells a story of one in his hometown. He said the old ladies in town managed to shut it down. They were filling their handbags full of fried chicken and fixings for lunch the following day. Agents of SHIELD! - Woohoo! Looks like fun! Most days, I feel like a used cow for sale! And the horror of knowing that one of your fav restaurants got closed for health violations, ugh!! That would make me wig out bad. For someone who didn't have inspiration for a post, you did a great job with this! Because it's JW, I'll give it a shot. I really liked Dollhouse until they messed it up at the end of the season. Now Firefly I've watched more than once! Love the story about the all you can eat, and the tie in at the end of the post! Too funny!